Yesterday evening (03/05), Mark (M0MJH) emailed 3 station in VK7 (Tasmania) that had been worked by GS3PYE/P with a view to setting up a sked on 20m longpath this morning (04/05) somewhere between 0600 and 0730UTC using his QRP HF backpack setup. A few hours later he had received emails back from VK7ZE (Laurie), VK7AC (Norman) and VK7XX (John) who all agreed that they would do their best to be on the air to call Mark. The time and the frequency of 14.342.5 was set. Mark managed to drag himself out of bed at 0530UTC (0630 local time) this morning, grab his backpack, head out of the house and wander down the driveway away from the house so not to wake those still sleeping. He started calling CQ VK longpath on the agreed frequency for 5-10 minutes with no response and then heard John VK7XX saying that there was a lot of QRM from a station on a nearby frequency and to move up. The frequency was changed to 14.347 and Mark started calling again, this time he was greeted by an S8 signal from John and was informed that he was being received at 5 and 5 in VK7. John asked Mark to stand by for a minute whilst he called Laurie and Norman on 2m. A couple of minutes later Laurie VK7ZE appeared with an even stronger signal (S9) and told Mark that he was S7 at his QTH. Mark chatted with both stations for around 10 minutes with solid copy on all sides of the QSO before Laurie and John had to go QRT. Thanks were passed between all stations and they parted company. 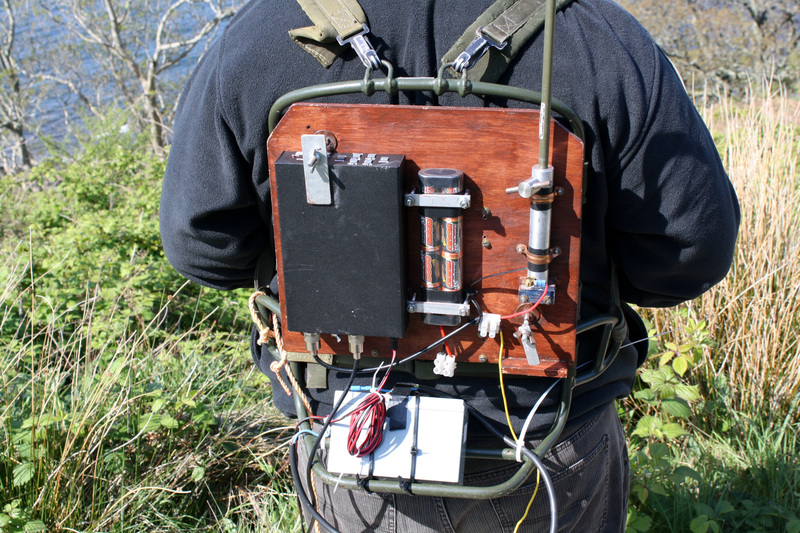 Mark’s QRP HF backpack consists of a Yaesu FT817ND, an LDG Z11pro Automatic ATU, a 16ft (5m) long Racal whip and a 16ft long trailing counterpoise wire. These are mounted on an RT320 Clansman radio frame and the power is drawn from a 12v 7aH battery mounted on the bottom of the pack. Photos to appear later. Many thanks again to John VK7XX and Laurie VK7ZE and it was a shame that Norman VK7AC wasn’t able to turn up. 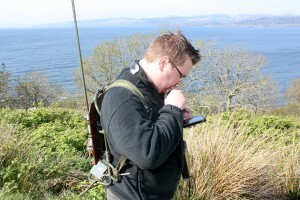 Great story Mark.That must have given u all great satisfaction to work VK with QRP frm Arran Island. Vy nice to read this story. Well done Mark, a real achievement on the QRP! 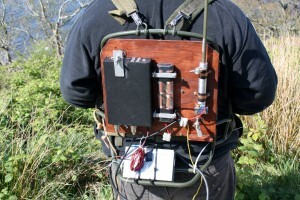 I know too well how hard it is to work longpath with QRP pedestrian mobile, so well done mate.